I’m always curious, when I see artist’s drawings or paintings as to WHY they choose to draw that particular way or paint in that manner. I wonder if they draw a certain way because it’s what’s most natural to them? Or is it because it gives them “the look” they want? Or is it simply because that’s how they were taught to draw? Or is it because they think or have found that “it sells”? Have they sought after “perfection” in drawing? Or have they sought to express their personality or likes/dislikes in the way they draw? Are these two necessarily separate from each other? Have they arrived at how they currently draw due to an evolution of sorts? Do they even think about it? 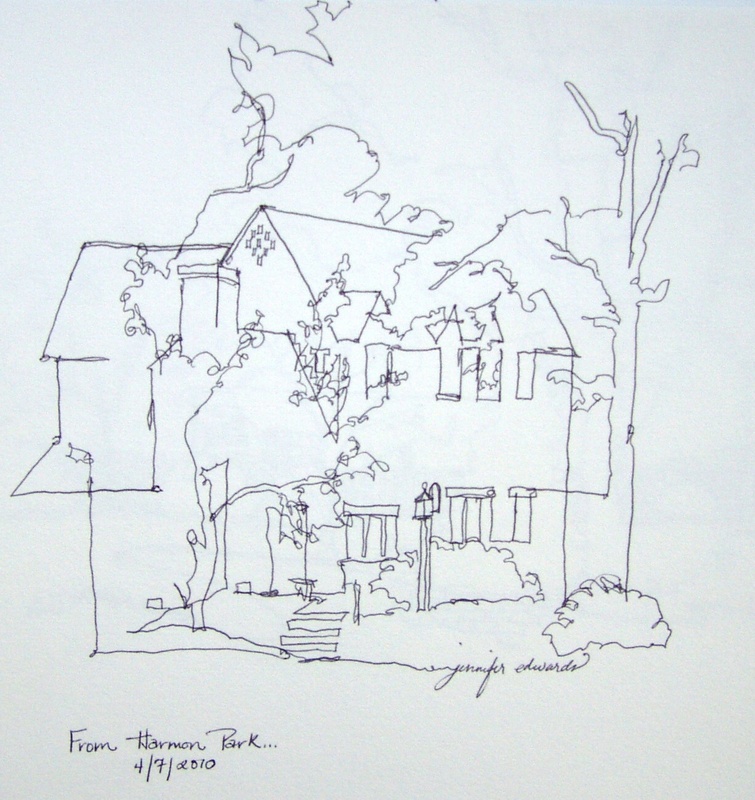 It is fascinating to me, looking at famous artists’ books, to look at the drawings. To me, drawings say much more than the finished pieces. I see more of the artist’s personality, their first-blush thoughts on what captivated them, the raw, un-touched flourishes of creativity shooting out their fingers. One of my favorite artists is Milton Avery. In one of my books of his artwork, there’s a drawing he did in art school: a beautifully rendered figure drawing containing all the shadows and proportions “just right”. Yet, his sketches and fabulous paintings do not reflect his ability to draw in this manner. WHY? Did he need to learn how to draw technically well in order to create the wonderfully simple lines and shapes of his paintings? Did he merely jump through the hoops of academic art rigors in order to get on with how he wanted to draw and paint? Van Gogh is another artist whose books often contain the drawings he grappled to achieve in the brief amount of time he spent in art school. They are quite good. Yet he eschewed the strictures of academia and the box they tried to squash him into. We are all so glad he drew and painted the way he did, because of the wonderful legacy of his art we enjoy. Yet it isn’t a matter of rebelling against technically astute, classically realistic drawing. For Sue Lyon, an amazing artist from whom I have taken a drawing class, her passion lies in rendering the human face and figure in a highly classical manner. This is BOTH how she was trained AND what she loves! Listening to her talk about the beauty of the curve of a cheekbone or the shadow that eyelashes cast just under the eye…you can see why she draws the way she draws. I ought to interview her for a blog post some day. Anyway, my point is, that each and every artist does have a unique “handwriting” in the way he/she draws. My own “handwriting” seems to change a lot. Looking at how I was drawing just one year ago (above drawing), I see I was taken with values. Line was there, but subservient to the value structure of a scene or a face. 1. Continuous line drawing allows me to become thoroughly absorbed in observing the contours of what’s around me. 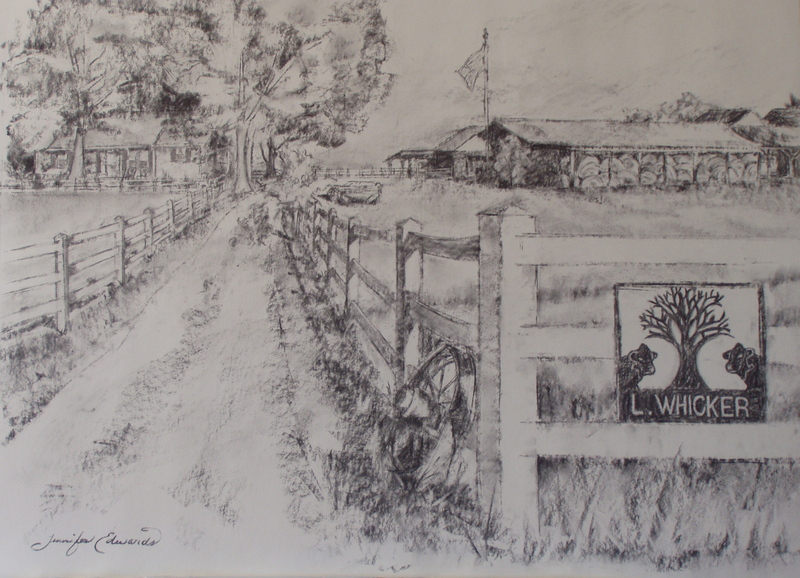 I have needed, for many years, to feel a connection between being an artist and the life I live as wife, mom, friend, resident of small town USA. Somehow, line drawings do that for me. 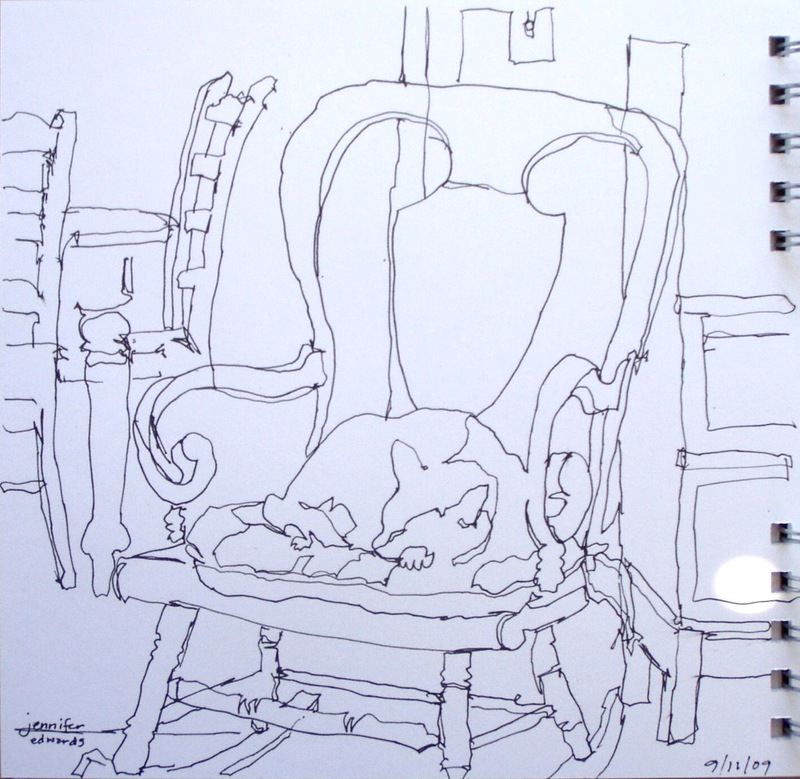 Not only drawing the subject matter of my everyday life, but the actual process of continuous line drawing provides this connection…a way to see, to celebrate, to recognize the beauty of my little life. Other ways of drawing, where you’re picking up your pen or pencil a gazillion times in one drawing, do not give me a feeling of continuity. I’m desperate for continuity. 2. 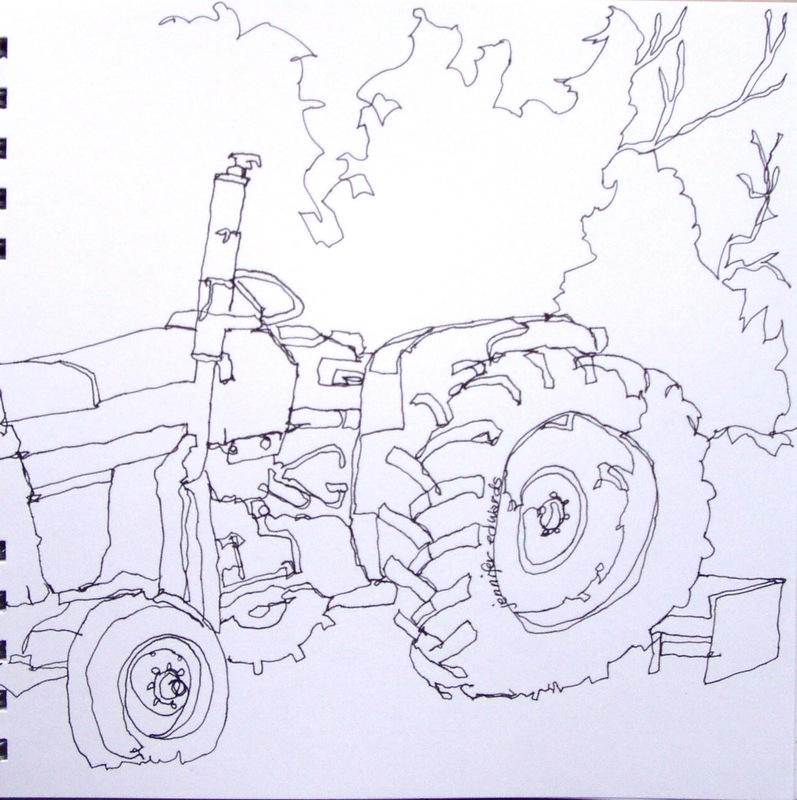 Continuous line drawings reveal to me the connections BETWEEN the things/objects/people I’m observing. As I’m drawing a particular contour, let’s say of the window pane, my eye then sees where my child’s hair is and I begin drawing the hair. They are connected shapes, not separate entities. Without continuous line drawing, I tend to chop up everything in my view without connecting them, resulting in a confusing mishmash of isolated elements. 3. Continuous line drawings teach me to slow down and compare relationships. 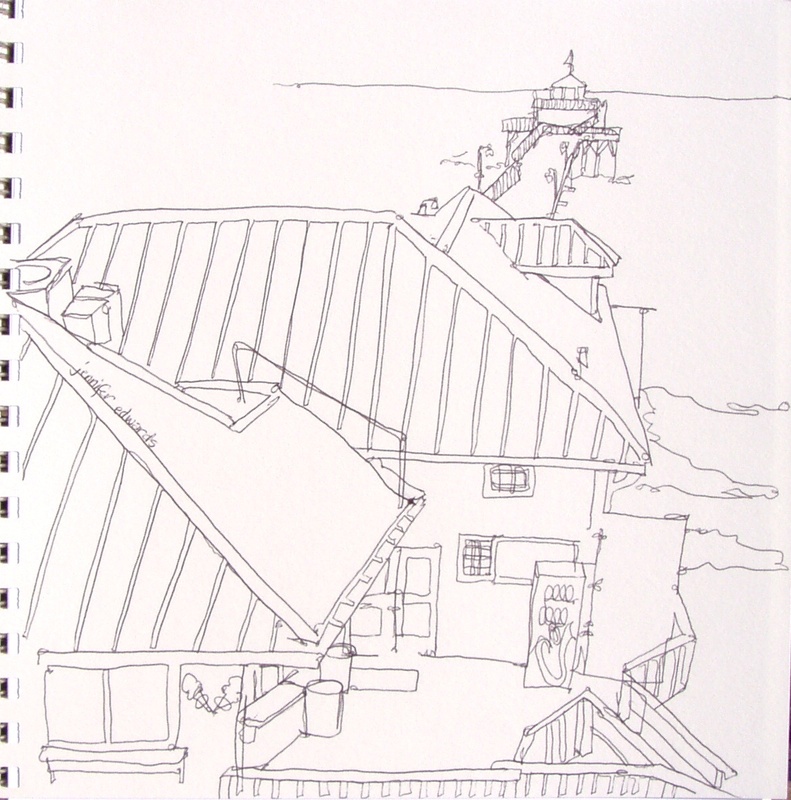 As I’m drawing the roofline, I pause to observe (and possibly even sight measure with my pen) the length of the pier in relationship to the length of the roofline. I’m not after exact proportions at all, just an observation of the relationship in size and shape to each other. 4. Continuous line drawings result in a heightened sense of abstraction. This, for me, makes for the most exciting drawings! Line is by its own virtue, a highly abstracted way of rendering the world around us. Line is not real. If I draw a line to denote the outer edge of the tractor tire, and you go up to the tire to look for that line, it will not be there! Lines do not exist in nature…where everything is three dimensional. Yet lines can be used to show us depth and space, and can even be used to render shadow shapes, and value passages. But in continuous line drawings, with all the connections and lines left UNdrawn, you get something wonky and slightly off-kilter…which I LOVE! I’ll stop there…I could go on and on about this favorite way to draw, as well as why I choose pen over pencil (that will be another post:). But I want to hear from you! I think it would be oh-so-cool for EDM artists and any others who’d like, to blog about WHY they draw the WAY they draw. Make it short and sweet or long and wordy like mine. Describe for us the journey you’ve been on with drawing approaches. Maybe you’re just beginning to draw, and you’re trying to use some of Danny Gregory‘s helpful tips from his books on ways to draw. Maybe you bounce around from style to style to try to discover something from each of them and then incorporate them into a way you really enjoy. Maybe you draw the way you were taught in art school. Maybe you haven’t ever thought about it and don’t want to. Tell us that too and why. WHATEVER it is, I’d love to read about it (and see accompanying drawings:) Your post could be titled the very same as this one, and then we will all recognize the subject and read each others posts. Could be really fun and revealing, don’t ya think? The one thing I do know about all this business of HOW I draw…is that my approach to drawing WILL change! It certainly has over the 12 years I’ve been pursuing art, and it will continue to change and evolve…just like my handwriting. If you’re interested in reading others posts of mine on drawing and line, check here…here…here…here…here…here…here…and here. Goodness, I do love this stuff! I noticed it much earlier that you’ve been doing continuous line drawing. I was even thinking if you actually do a drawing with a single stroke of pen. But it’s really nice to understand why you draw the way you draw. I myself is seeking variety. I can’t stay on a single style for too long, and I am a strong believer that art can be created with the most common school/office writing instruments. $20 for a tube of watercolor to me is ermm.. unnecessarily expensive. I love pencils because of the flexibility, it’s the instrument we use when we start to learn how to write or draw, back to basics. I love pencils because it produces black and white images, long lasting, and waterproof too(as an engineer, I appreciate that very much), plus it feels like those old photographs taken decades ago. Pencils are easy to carry around, and abundant, most importantly cheap. This is very interesting! I’m saving it for reread and think! First, I want to say that I love your continuous line drawings, there’s something that draws me to them, something that I find also in your words about why you do them. The simple, clear lines, like your vision is clearer, purer. And I find peace and clarity when I look at them. Makes me want to try, too. Terrific post! I think it is natural and expected that our style of drawing will change over time just as the way we perceive the world changes. I also think that had you not studied drawing from a more “classical” perspective, using value to find shapes and to show form, that you would not be able to communicate so clearly with just contour line. It takes knowing how to see to do that. And that takes lots of practice 🙂 And I love your continuous contour line drawings! Your drawings are amazing and quite varied! Very good work! There are some parallels with my experience. For a long I avoided line entirely, drawing in conte’ pencil, I used swaths of values to good result. I think this was extraordinarily useful, especially when I began painting because everything in painting is values. Then, I picked up the pen and loved the challenge of drawing well in pen using line. I would include much detail in the pen drawings. 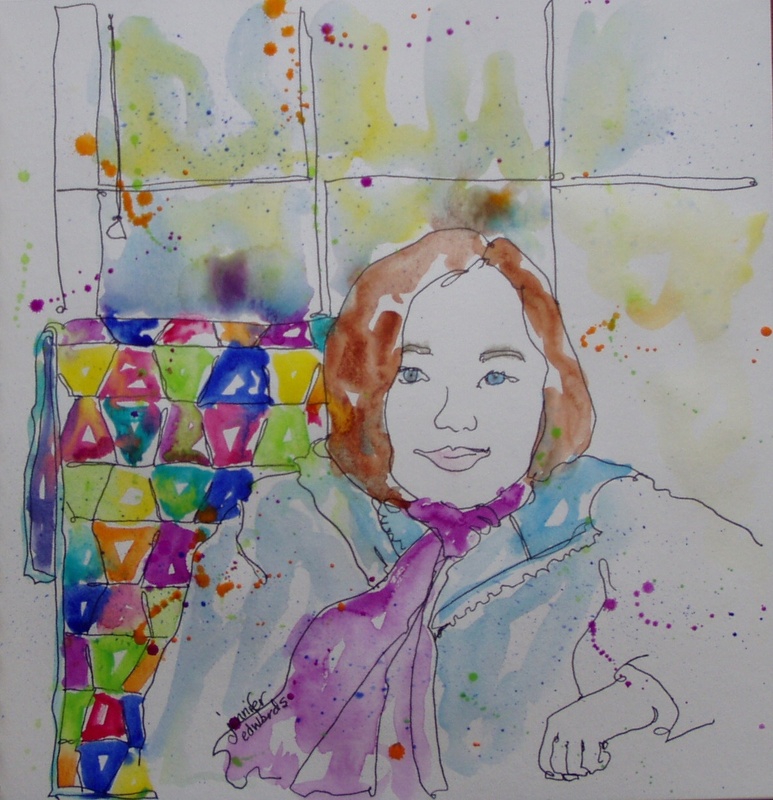 Then I started watercolor, and my ink drawings scaled back to accommodate the color – less was more, in the combination. I have had very little training but have devoured many, many books. So I am self-taught, and for now I try the challenge of drawing in pen what I see, often in public, but with the important caveat that I am not hung up on realism and love stray lines for the challenge and uniqueness they bring when I use them! I am very conscious of angles and distance between points when I draw but they are invisible, and I do not draw guidelines on the page. I draw all the time. This has greatly improved my abilities. If I see a gap, I will buy a book to help – for example, I am now ordering a book on drawing hands. Sure, I have drawn a good hand now and then – but many times not, and I want it to be as natural as breathing. Interesting perspective and thanks for sharing…I got here from the everydaymatters group. I’m still a beginner, but I like to draw because it seems to come naturally and I don’t really plan…it’s like the muse coming out. I actually find it harder when I plan something or purposefully trying to push myself to do something…doesn’t work I guess! Your work is fabulous btw, thanks for sharing. I love this post and I’m off to think. To formulate my response for a coming post. I’ll let you know when it’s up! Thank you, by the way, for always doing this to me…you keep my brain working! 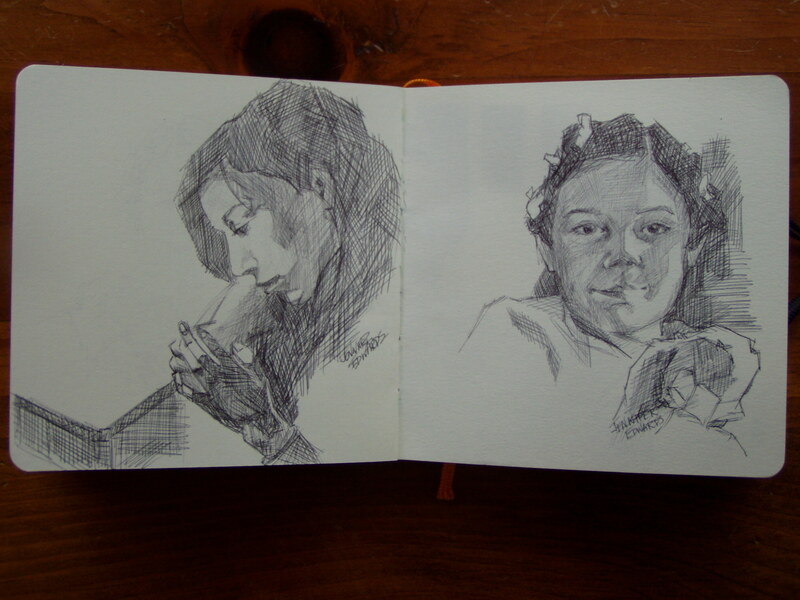 Most of the time, I draw with a ballpoint pen (black ink). And, most of the time, I’m pretty satisfied with the way that things come out in the end. I’m occasionally frustrated by a stray line or bobble that doesn’t really belong but then I figure, eh, what the heck? It’s not hurting anything and I move on. I use pencil on things that I want to look as realistic as possible, like a portrait that I’m trying to do of my oldest son. Lord, it frustrates me. I’ve erased his entire head more times than I can count! For me, really, it’s all about the color. I love colors. I usually find myself blowing through the drawing part so I can get to the coloring part. Apparently, I am a first grader with her first set of colored pencils or watercolors. I want to use them, all of them, and RIGHT NOW. I’m sure, as I continue drawing daily, my style will change. I would hope to improve technically, but even if I don’t, it’s ok. It’s fun. If the “not fun” is in greater proportion than the “fun”, I’ll stop until I can get my priorities in order. I draw the way I do because of very limited training – something I want to change. So my style and skill represent that of a learner, I’m not a “natural”. I see other styles I like, but don’t know how to achieve them. I do a bit of rubber stamping, too, so it’s easier to find a style I like in a rubber stamp and buy the stamp and practice coloring and shading with that. I prefer pencils because I can erase what I don’t like. When I use a pen, the pictures tend to be “busier” because I have to cover up the “wrong” stuff with better placed lines. I think my best work was done in college, in a class, and was done by gridding and copying someone else’s design. I’ve used this many times since then, but to me, that isn’t art, it’s copying. Regardless of how well I can do it. It’s a tool, not an art style. This is TOTALLY AWESOME!! It’s so great to hear from all of you about this subject! Thanks for taking the time! So cool. thats such an interesting topic and it made me think a bit more about why I draw the way I do it. Like you, I always wonder how and why the artist did what he/she did and I find my eyes are following the lines around the work. I went to art school, and each teacher there had their own take on how you had to do it, and of course many of them tried to mold you to something that to what they had learned and now so stronly believed that this is how you do it. My favourite teacher, he always got us to start our day with drawing with out left hands (right if you were left handed), and it was amazing how different the lines were and it made you more aware about what you were really doing and trying to do. I still do it from time to time, and it kind of wakes me up. I have different styles and they all matter of what mood Im in, and what Im working on. Thanks for opening this subject up for discussion by sharing your journey with us. My interest bobs all over the place- acrylics, watercolor, oil, colored pencil, journaling, and pencil. Though I am still dabbling in all of them, I have been trying to concentrate a little more on using the pencil. Right now I am more into realism (but not necessarily photo exact) and learning to shade and values. I know I am on a journey and my interests are growing and changing from being exposed to everyone’s art. The pencil someone pointed out means I always have my art supplies with me. I can make art anywhere with it. I am excited by that idea. The pencil opens a world of freedom that I have not had before to do art (anywhere, anytime). Also, what I learn with the pencil will make me a better artist in all the other areas that I am interested in. I’ve posted a fake journal page on my blog using a quote from your post. You can see it here. Now I am thinking more about what I am doing and why. What great sketches and interesting thoughts. I am so pleased to have found your blog via EDM site. Your articles are wonderfully stimulating and your sketches simply beautiful!